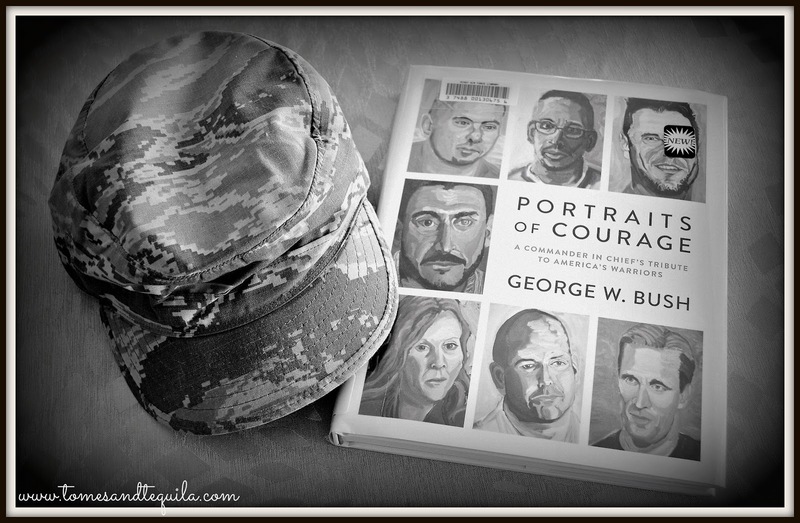 As soon as the book Portraits of Courage by George W. Bush landed on my desk at the library, I knew I needed to read and review it. Now, before I lose half of my readers due to politics, let me say right off the bat that this review is going to have nothing to do with politics. I am one of those people who likes to keep my political opinions to myself normally, and this is not a political blog. I have Republican friends, Democrat friends, Libertarian friends, and friends who don't know what that last one means...and I love them equally (normally). I lost zero friends during this last election, and I don't plan on starting to alienate anyone now. But what this review WILL be about is our military. Now, if this is the first time you've ever been to my blog (and a giant welcome to you!!!) I will start this review by saying...I am not unbiased when it comes to our military...so this will not be an unbiased review. I can't pretend to have kept my personal life out of things when reading, because my background is just a part of who I am. I don't write about it a lot on the blog, but I am married to a career Air Force guy. I also have a daughter attending the Naval Academy at the moment. I just left my job at a Library on a military base, and we are headed to the DC area for what may be the last location in my husband's long military career. I am not going to go on a pro-military, pro-gun, pro-whatever tangent...but the military is a large part of my life and the lives of the majority of my friends. Portraits of Courage truly moved me, and I'm giving it 5 stars without an ounce of hesitation. In his retirement years post-presidency, one of the things George W. Bush has done to occupy his time is to start up the hobby of painting. I don't have an artistic bone in my body, so I have a tremendous amount of respect for anyone who can paint or draw someone, and have it turn out looking like the desired subject. 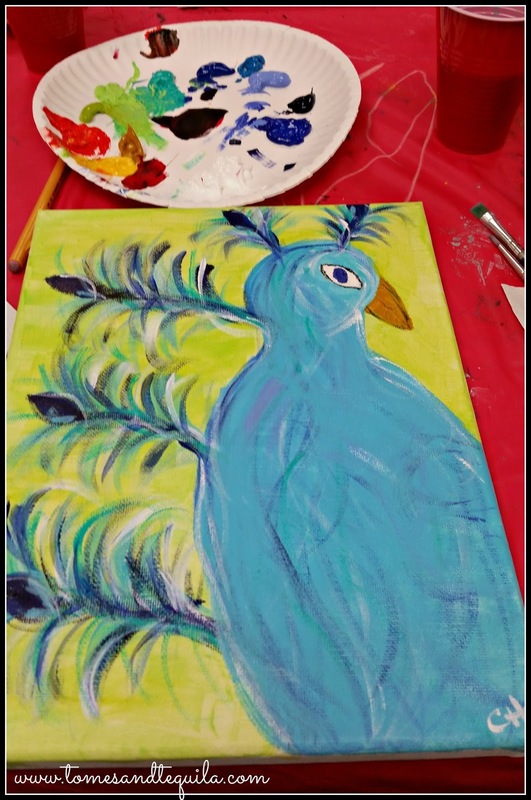 I'm not being self-depricating, I'm sure I can find a photo to illustrate this from one of the times I went to a wine and paint event with my girlfriends. I had a blast, but to call my finished piece art would be pushing the term. Bush took up the hobby when he heard that Churchill had painted. The intro where he talks about deciding to paint, finding people to teach him, and evolving from cubes to eventually painting the wounded warriors that fill this book is both funny, clever and filled with a wit and self-awareness that was at times missing during his presidency. And that's just the intro. 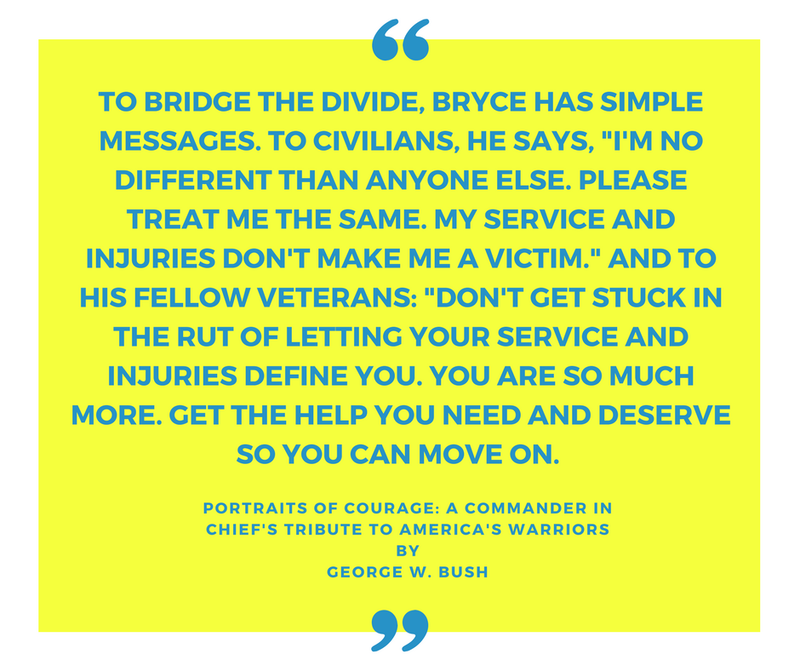 Portraits of Courage is filled with paintings and profiles of wounded warriors that Bush has met during his golf and mountain-biking events through his Military Service Initiative at the George W. Bush Presidential Center. 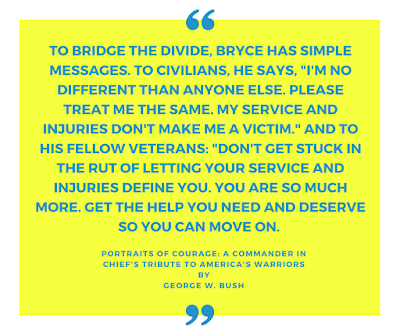 (and his net author proceeds of the book go to the center) Each profile details the military member's service career, how they were wounded, Bush's interaction with them, and a little about their issues since they were wounded and how they've been helped afterwards. It calls attention to Post Traumatic Stress and Traumatic Brain Injuries, along with the physical wounds that many came home with. Most of these Veterans ride bikes, do triathlons, and play golf with missing limbs...eye injuries...and wounds I can't even wrap my head around. Reading the book, I was both moved by Bush's genuine care for these Veterans and by their extreme strength and tenacity, which was expressed throughout the volume. I read many passages out loud to my husband and son. When Bush described having tears in his eyes when visiting with some of these guys at Walter Reed, I knew that it came from his heart because as a military spouse I have paid attention to the stories of him visiting hospitals...I have seen the photos of him moved to tears. I also know that for every story that I've seen, there are many more that I haven't. His love of the troops feels honest to me, and you can feel it as you read this book. And although it looks like a standard coffee table book, it is one of the rare books that I read from cover to cover...including every foreword, dedication, post-script and acknowledgment. And if this review doesn't make you want to give the book a glance, watch his interview with Jimmy Kimmel...or with Ellen. You will see that this is a passion project for him. So, 5 stars all the way. I went to bed last night counting my blessings, because this book was a big reminder of how lucky my family is...and a reminder yet again of how resilient the members of my giant military family are. We live in a weird time, where people's feelings about the military are often incredibly conflicted. This book puts a face to a lot of people who would say they were ordinary and just doing their jobs, but who others would unequivocally call heroes. I am blessed to be surrounded by people like this on a regular basis. This book was a reminder.